Wahhhh. I basically dropped off the face of the planet this week and I’m sorryyy. I ended up getting really sick and basically just sleeping during the time I wasn’t working (which so isn’t like me at all… frankie was shocked). I sort of feel like a real human again (THANK GOD) and Frankie and I actually have a wedding we’re going to today as our date for this week… awww. unless we go somewhere else interesting that I can talk about! BUT. Last week’s date. oh. my. god. it was definitely the best one we’ve had yet. We were both in the mood (and had been for a while) for mexican. 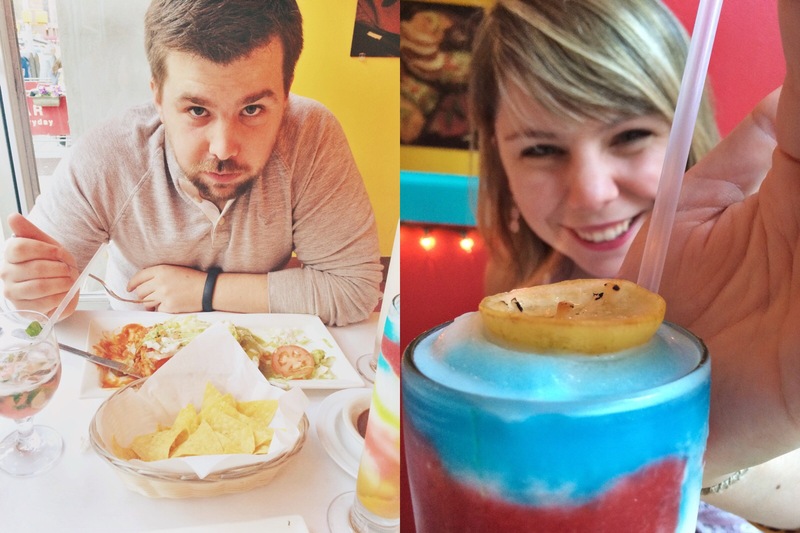 I did some yelping around and eventually we chose Noche de Margaritas. honestly we were sold after seeing pictures of the frozen margaritas THAT THEY SET ON FIRE. What?! Yeah. It’s a thing. We made our reservation for 6:30 and headed over there like ten minutes before since it was only two blocks away from our apartment. Which is probably the most dangerous part of all this. When we walked up to the front door, I realized HAPPY HOUR WAS UNTIL 7! UM, what?! 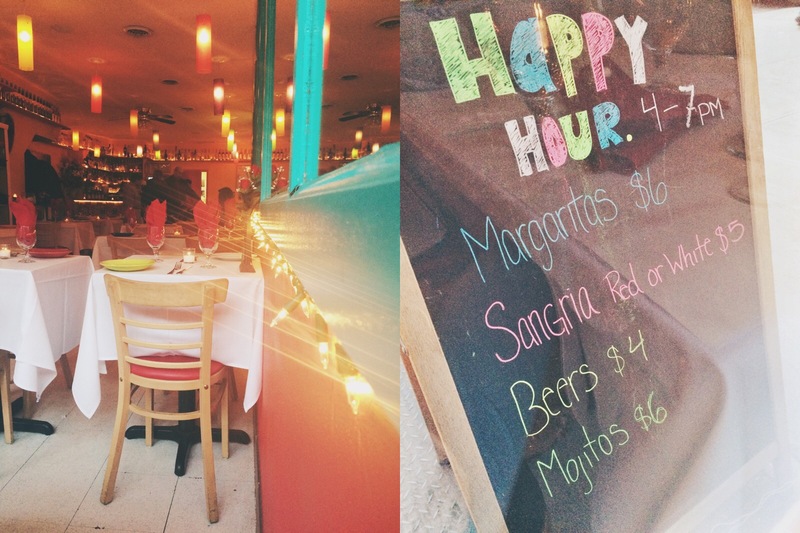 and the happy hour specials were actually pretty stellar. naturally we both decided we needed to get at least TWO drinks on happy hour prices so we marched right in and ordered our first round. Like I said, we both knew we wanted happy hour drinks, so we decided on our mojitos and ordered them as fast as we could. The waiter was so nice and explained everything to us, including how accommodating the chefs were if you wanted to change something or mix and match, etc. They brought us out some chips and salsa and also brought us a spicy verde salsa and a mole sauce to try. They were all amazing. I had obviously yelped around and knew that the guacamole was prepared in front of you if you ordered it. Frankie and I were both super into that and jumped on the opportunity. Juan, our waiter, brought out this big platter of ingredients and let us pick and choose what we wanted to include… which was basically everything. let me tell you. this guac was… SO FREAKING GOOD. it hurts to think about. i can’t even explain it to be honest. you just have to go try it. ugh. For our dinners, I ordered carnitas tacos, I’ve been really into the pork scene lately. and they were… amazing. I can’t. i used some of the mole sauce and the salsa verde sauce on them both and it was just. out of this world. I ordered them with crispy shells and they gave me soft instead, but i wasn’t even mad. didn’t even consider telling them. i was overwhelmed by how great everything was. Frankie loved his burrito. like LOVED. he was mad that we waited so long to go there and kept saying he wanted to be regulars. He even mentioned that he wanted them to cater our wedding… things clearly got a little out of hand. At one point i think he might have mentioned he hadn’t been that happy about food since we were in italy. a bold statement ladies and gents…. very bold. UM. but that dessert though. it was vanilla ice cream fried in CORN FLAKES. drizzled with cinnamon sugar and maple syrup on top of fried tortillas(?) maybe it was just crisps, i’m unsure. it was… so amazing. and Juan brought us free shots of pineapple tequila to take with the dessert. guys. i don’t do shots. i can’t do them. they make me sick. when i tell you… i didn’t even flinch. i threw that puppy back like a champ. The whole experience at Noche de Margaritas was so amazing. Frankie has been telling EVERYONE we know about it. and i mean everyone. We even have reservations to go back on tuesday (cinco de mayo!!!!). basically. if you’re on the upper east side, it’s worth your time. If you’re not in NYC but come to visit me… we’re going. sorry bout it. I don’t even know what else to say you guys. i don’t even know…. so you should tell ME what you’ve been doing. Where have you been dating? what’s your favorite date spot? any places in NYC i absolutely MUST try?